Describe the factors that contribute to self-concept. Describe how the self-fulfilling prophecy works. In the first of the Note 3.1 “Introductory Exercises” for this chapter, you listed terms to describe yourself. This exercise focuses on your knowledge, skills, experience, interests, and relationships. Your sense of self comes through in your oral and written presentations. Public communication starts with intrapersonal communication, or communication with yourself. You need to know what you want to say before you can say it to an audience. Understanding your perspective can lend insight to your awareness, the ability to be conscious of events and stimuli. Awareness determines what you pay attention to, how you carry out your intentions, and what you remember of your activities and experiences each day. Awareness is a complicated and fascinating area of study. The way we take in information, give it order, and assign it meaning has long interested researchers from disciplines including sociology, anthropology, and psychology. Your perspective is a major factor in this dynamic process. Whether you are aware of it or not, you bring to the act of reading this sentence a frame of mind formed from experiences and education across your lifetime. Imagine that you see a presentation about snorkeling in beautiful Hawaii as part of a travel campaign. If you have never been snorkeling but love to swim, how will your perspective lead you to pay attention to the presentation? If, however, you had a traumatic experience as a child in a pool and are now afraid of being under water, how will your perspective influence your reaction? Peaceful or dangerous? Your perception influences your response. 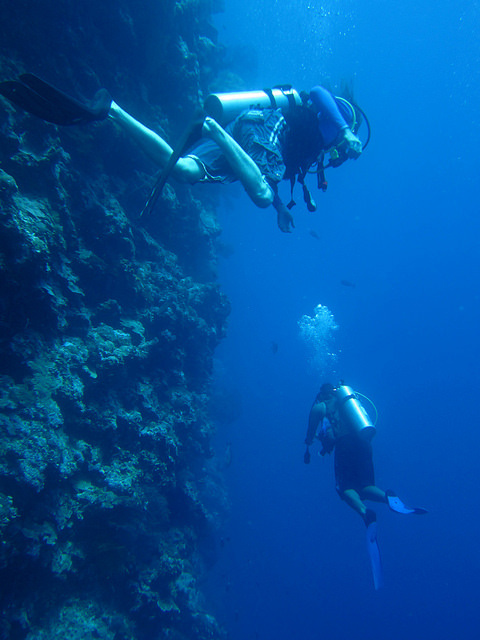 sandwich – bryan and jason, diving a wall – CC BY-NC-ND 2.0. Learning to recognize how your perspective influences your thoughts is a key step in understanding yourself and preparing to communicate with others. The communication process itself is the foundation for oral and written communication. Whether we express ourselves in terms of a live, face-to-face conversation or across a voice over Internet protocol (VoIP) chat via audio and visual channels, emoticons (:)), and abbreviations (IMHO [In My Humble Opinion]), the communication process remains the same. Imagine that you are at work and your Skype program makes the familiar noise indicating that someone wants to talk. Your caller ID tells you that it is a friend. You also know that you have the report right in front of you to get done before 5:00 p.m. Your friend is quite a talker, and for him everything tends to have a “gotta talk about it right now” sense of urgency. You know a little bit about your potential audience or conversational partner. Do you take the call? Perhaps you chat back “Busy, after 5,” only to have him call again. You interpret the ring as his insistent need for attention, but you have priorities. You can choose to close the Skype program, stop the ringing, and get on with your report, but do you? Communication occurs on many levels in several ways. When we communicate, we are full of expectations, doubts, fears, and hopes. Where we place emphasis, what we focus on, and how we view our potential has a direct impact on our communication interactions. You gather a sense of self as you grow, age, and experience others and the world. At various times in your life, you have probably been praised for some of your abilities and talents, and criticized for doing some things poorly. These compliments and criticisms probably had a deep impact on you. Much of what we know about ourselves we’ve learned through interaction with others. Not everyone has had positive influences in their lives, and not every critic knows what they are talking about, but criticism and praise still influence how and what we expect from ourselves. Carol Dweck, a psychology researcher at Stanford University, states that “something that seems like a small intervention can have cascading effects on things we think of as stable or fixed, including extroversion, openness to new experience, and resilience.” (Begley, 2008) Your personality and expressions of it, like oral and written communication, were long thought to have a genetic component. But, says Dweck, “More and more research is suggesting that, far from being simply encoded in the genes, much of personality is a flexible and dynamic thing that changes over the life span and is shaped by experience.” (Begley, 2008) If you were told by someone that you were not a good speaker, know this: You can change. You can shape your performance through experience, and a business communication course, a mentor at work, or even reading effective business communication authors can result in positive change. When you consider what makes you you, the answers multiply as do the questions. As a baby, you learned to recognize that the face in the mirror was your face. But as an adult, you begin to wonder what and who you are. While we could discuss the concept of self endlessly and philosophers have wrestled and will continue to wrestle with it, for our purposes, let’s focus on self, which is defined as one’s own sense of individuality, motivations, and personal characteristics (McLean, 2003). We also must keep in mind that this concept is not fixed or absolute; instead it changes as we grow and change across our lifetimes. One point of discussion useful for our study about ourselves as communicators is to examine our attitudes, beliefs, and values. These are all interrelated, and researchers have varying theories as to which comes first and which springs from another. We learn our values, beliefs, and attitudes through interaction with others. Table 3.1 “Attitudes, Beliefs, and Values” defines these terms and provides an example of each. Attitudes Learned predispositions to a concept or object Subject to change I enjoyed the writing exercise in class today. Beliefs Convictions or expressions of confidence Can change over time This course is important because I may use the communication skills I am learning in my career. Values Ideals that guide our behavior Generally long lasting Effective communication is important. An attitude is your immediate disposition toward a concept or an object. Attitudes can change easily and frequently. You may prefer vanilla while someone else prefers peppermint, but if someone tries to persuade you of how delicious peppermint is, you may be willing to try it and find that you like it better than vanilla. Beliefs are ideas based on our previous experiences and convictions and may not necessarily be based on logic or fact. You no doubt have beliefs on political, economic, and religious issues. These beliefs may not have been formed through rigorous study, but you nevertheless hold them as important aspects of self. Beliefs often serve as a frame of reference through which we interpret our world. Although they can be changed, it often takes time or strong evidence to persuade someone to change a belief. Values are core concepts and ideas of what we consider good or bad, right or wrong, or what is worth the sacrifice. Our values are central to our self-image, what makes us who we are. Like beliefs, our values may not be based on empirical research or rational thinking, but they are even more resistant to change than are beliefs. To undergo a change in values, a person may need to undergo a transformative life experience. For example, suppose you highly value the freedom to make personal decisions, including the freedom to choose whether or not to wear a helmet while driving a motorcycle. This value of individual choice is central to your way of thinking and you are unlikely to change this value. However, if your brother was driving a motorcycle without a helmet and suffered an accident that fractured his skull and left him with permanent brain damage, you might reconsider this value. While you might still value freedom of choice in many areas of life, you might become an advocate for helmet laws—and perhaps also for other forms of highway safety, such as stiffer penalties for cell-phone talking and texting while driving. Your self-concept is composed of two main elements: self-image and self-esteem. Your self-image is how you see yourself, how you would describe yourself to others. It includes your physical characteristics—your eye color, hair length, height, and so forth. It also includes your knowledge, experience, interests, and relationships. If these sound familiar, go back and look at the first of the Note 3.1 “Introductory Exercises” for this chapter. In creating the personal inventory in this exercise, you identified many characteristics that contribute to your self-image. In addition, image involves not just how you look but also your expectations of yourself—what you can be. Putting your self-image and self-esteem together yields your self-concept: your central identity and set of beliefs about who you are and what you are capable of accomplishing. When it comes to communicating, your self-concept can play an important part. You may find that communicating is a struggle, or the thought of communicating may make you feel talented and successful. Either way, if you view yourself as someone capable of learning new skills and improving as you go, you will have an easier time learning to be an effective communicator. Whether positive or negative, your self-concept influences your performance and the expression of that essential ability: communication. In addition to how we view ourselves and feel about ourselves, of course, we often take into consideration the opinions and behavior of others. Charles Cooley’s looking-glass self reinforces how we look to others and how they view us, treat us, and interact with us to gain insight of our identity. We place an extra emphasis on parents, supervisors, and on those who have some degree of control over us when we look at others. Developing a sense of self as a communicator involves balance between constructive feedback from others and constructive self-affirmation. You judge yourself, as others do, and both views count. Now, suppose that you are treated in an especially encouraging manner in one of your classes. Imagine that you have an instructor who continually “catches you doing something right” and praises you for your efforts and achievements. Would you be likely to do well in this class and perhaps go on to take more advanced courses in this subject? In a psychology experiment that has become famous through repeated trials, several public school teachers were told that specific students in their classes were expected to do quite well because of their intelligence (Rosenthal & Jacobson, 1968). These students were identified as having special potential that had not yet “bloomed.” What the teachers didn’t know was that these “special potential” students were randomly selected. That’s right: as a group, they had no more special potential than any other students. Can you anticipate the outcome? As you may guess, the students lived up to their teachers’ level of expectation. Even though the teachers were supposed to give appropriate attention and encouragement to all students, in fact they unconsciously communicated special encouragement verbally and nonverbally to the special potential students. And these students, who were actually no more gifted than their peers, showed significant improvement by the end of the school year. This phenomenon came to be called the “Pygmalion effect” after the myth of a Greek sculptor named Pygmalion, who carved a marble statue of a woman so lifelike that he fell in love with her—and in response to his love she did in fact come to life and marry him (Rosenthal & Jacobson, 1968; Insel & Jacobson, 1975). In more recent studies, researchers have observed that the opposite effect can also happen: when students are seen as lacking potential, teachers tend to discourage them or, at a minimum, fail to give them adequate encouragement. As a result, the students do poorly (Schugurensky, 2009; Anyon, 1980; Oakes, 1985; Sadker & Sadker, 1994). When people encourage you, it affects the way you see yourself and your potential. Seek encouragement for your writing and speaking. Actively choose positive reinforcement as you develop your communication skills. You will make mistakes, but the important thing is to learn from them. Keep in mind that criticism should be constructive, with specific points you can address, correct, and improve. We communicate those expectations with various cues, verbal and nonverbal. People tend to respond to these cues by adjusting their behavior to match the expectations. The outcome is that the original expectation becomes true. You can become a more effective communicator by understanding yourself and how others view you: your attitudes, beliefs, and values; your self-concept; and how the self-fulfilling prophecy may influence your decisions. How does your self-concept influence your writing? Write a one- to two-page essay on this topic and discuss it with a classmate. Make a list of at least three of your strongly held beliefs. What are those beliefs based on? List some facts, respected authorities, or other evidence that support them. Share your results with your class. What are some of the values held by people you know? Identify a target sample size (twenty is a good number) and ask members of your family, friends, and peers about their values. Compare your results with those of your classmates. Make a list of traits you share with your family members. Interview them and see if anyone else in your family has shared them. Share and compare with your classmates. What does the field of psychology offer concerning the self-fulfilling prophecy? Investigate the topic and share your findings. Anyon, J. (1980, Fall). Social class and the hidden curriculum of work. Journal of Education, 162(1), 67–92. Begley, S. (2008, December 1). When DNA is not destiny. Newsweek, p. 14. Cooley, C. (1922). Human nature and the social order (Rev. ed.). New York, NY: Scribners. Insel, P., & Jacobson, L. (1975). What do you expect? An inquiry into self-fulfilling prophecies. Menlo Park, CA: Cummings. McLean, S. (2003). The basics of speech communication. Boston, MA: Allyn & Bacon. Oakes, J. (1985). Keeping track: How schools structure inequality. Birmingham, NY: Vail-Ballou Press. Rosnow, R., & Rosenthal, R. (1999). Beginning behavioral research: A conceptual primer (3rd ed.). Englewood Cliffs, NJ: Prentice Hall. Rosenthal, R., & Jacobson, L. (1968). Pygmalion in the classroom. New York, NY: Holt, Rinehart, & Winston. Sadker, M., & Sadker, D. (1994). Failing at fairness: How America’s schools cheat girls. New York, NY: Macmillan Publishing Company. Schugurensky, D. (Ed.). (2009). Selected moments of the 20th century. In History of education: A work in progress. Department of Adult Education, Community Development and Counselling Psychology, The Ontario Institute for Studies in Education of the University of Toronto (OISE/UT). Retrieved from http://fcis.oise.utoronto.ca/~daniel_sc/assignment1/1968rosenjacob.html. Pygmalion in the Classroom was followed by many other school-based studies that examined these mechanisms in detail from different perspectives. Prominent among the works on this subject conducted by U.S. scholars are Rist, R. C. (1970, August). Student social class and teacher expectations: The self-fulfilling prophecy in ghetto education. Harvard Educational Review, 40(3), 411–451. 3.2 Self-Understanding Is Fundamental to Communication by University of Minnesota is licensed under a Creative Commons Attribution-NonCommercial-ShareAlike 4.0 International License, except where otherwise noted.